A lovely loop, following directions from Nick – cross the Gairnshiel bridge & follow track in off the road, follow the road out for about 1k to track opposite Shenval. 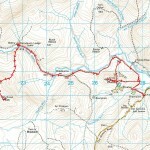 Follow track up towards Coire an tSlugain, with about 0.5 k through heather on deer tracks to ‘the notch’. 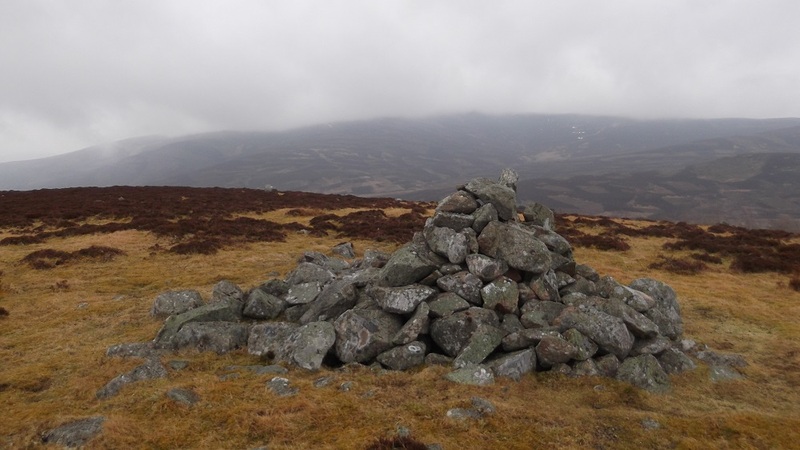 Up to the summit for the point, then south along the ridge to the actual ‘Fox Cairn’. 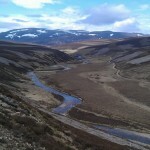 Great views of Glen Gairn below. Then descend via burn to the west, and along track to bridge at Tullochmacarrick. 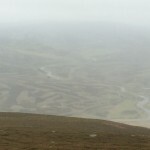 Onwards to my 50th point at Cnoc Chalmac – in the drizzle, so no photo…. Back to the road via Rineten, after finding a private crypt in the woods to SE of Cnoc Chalmac. This entry was posted in cp49, cp50 and tagged SamB, Warren on July 2, 2015 by site_admin. The Don, Gairn, Builig and Avon Rivers in a Day ! This was going to be a long day and so it proved. Set off on the bike from Strathdon and on the main road to Corgarff where I took the Old Military road up to the main road dropping down to Gairnshiel and then onto the track alongside the Gairn. 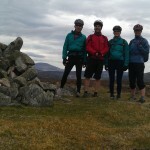 Dumping the bike at appropriate spots and putting on the running shoes I went up Cnoc Chalmac and the Foxs Cairn before jumping back on the bike to Loch Builig – following the Builig Burn into Glen Avon before coming back round and out at Corgarff. Good bike, great scenery and avoided the rain ! This entry was posted in cp49, cp50 and tagged DaveC on May 18, 2015 by site_admin. This entry was posted in cp32, cp49 and tagged D&E, DaveH, KathyD on May 15, 2015 by site_admin. 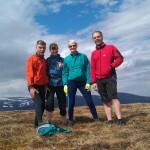 Biked with Kathy, Derek and Evelyn up Glen Gairn from near Gairnsheil Lodge as far as Corndavon Lodge, then walked up Tom Breac. Not an exciting hill, but a very good view from the top. Surprisingly dry as well – didn’t get wet feet at all. 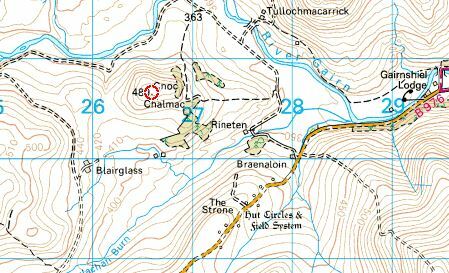 Walked back to the bikes, then headed back, and took the tack that goes nearly to the top of Cnoc Chalmac. The climb is quite hard, the descent back to the main track very nice. Didn’t even take our helmets off for the short walk to the top of the hill. Got back to the cars just as the rain was starting. Parked at the Geallaig race start and headed for Fox Cairn first. We headed up a slight valley to reach the top directly then followed path to cairn. Cnoc Chalmac was next then joined track until Katie managed to persuade me to turn off the lovely track just before the bridge and head through the heather to Tom Breac, it was a trudge with little running until very top. 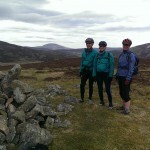 Good views and lovely descent to An Creagan. We considered adding Geallaig but concluded we would tick this one at the summer handicap. 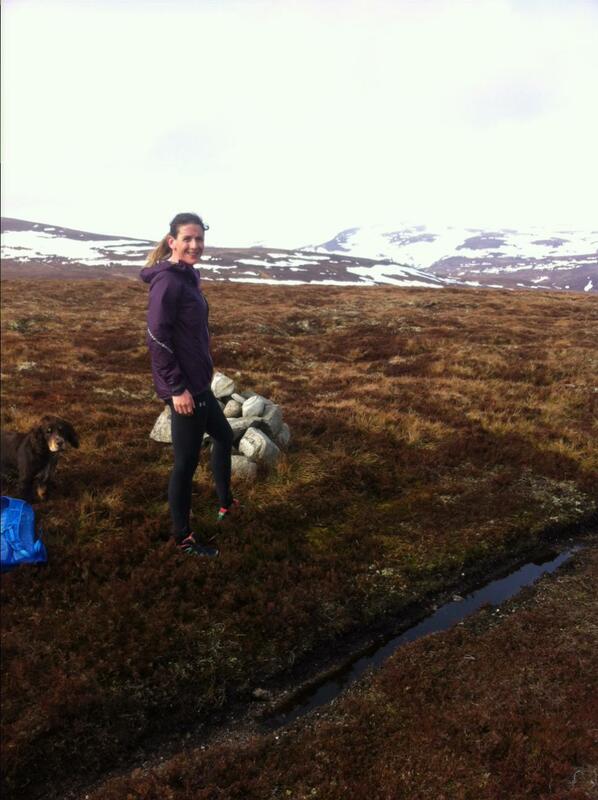 Photo shows Katie and Coogie on Tom Breac. This entry was posted in cp32, cp49, cp50 and tagged KatieH, MarieE on March 21, 2015 by site_admin. With the weather starting to close in, and not having much time, I headed west up Glen Gairn, leaving the car beside Braenaloin beyond Gairnshiel. I followed the track round then up the hill. The track carries on between the corner of a fenced field and a ruined building taking you beyond the trees and juniper. A narrow path continues up to the summit cairn. I spotted another hen harrier and in the lower fields lapwings, oystercatchers, curlew and golden plover. This entry was posted in cp49 and tagged Phil on March 16, 2015 by site_admin. 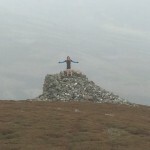 A fine jog up Coire an t-Slugain and Cnoc Chalmac with great views of the Geallaig Hill race. Mostly good running and once again great views. Have added a pic as attatchment but not had success last few times I have tried this. open to advice. This entry was posted in cp49, cp50, Uncategorized and tagged Duncan on February 12, 2015 by site_admin.